So I love finding eclectic foods and giving them a whirl! This recipe starts off with a couple of definitions because I know trying new foods can sometimes be a bit intimidating (yes as adventurous as I am there are some foods even I am afraid to try). Let’s start with Quinoa! Yes, it looks unusual and not many people have tried it, but it is a DEFINITE power house food! Quinoa is categorized as a grain, but it’s actually an edible seed. It’s lower in carbs than most grains, loaded with protein, and the same caloric value as brown rice. With all of these benefits, why not give it a try? 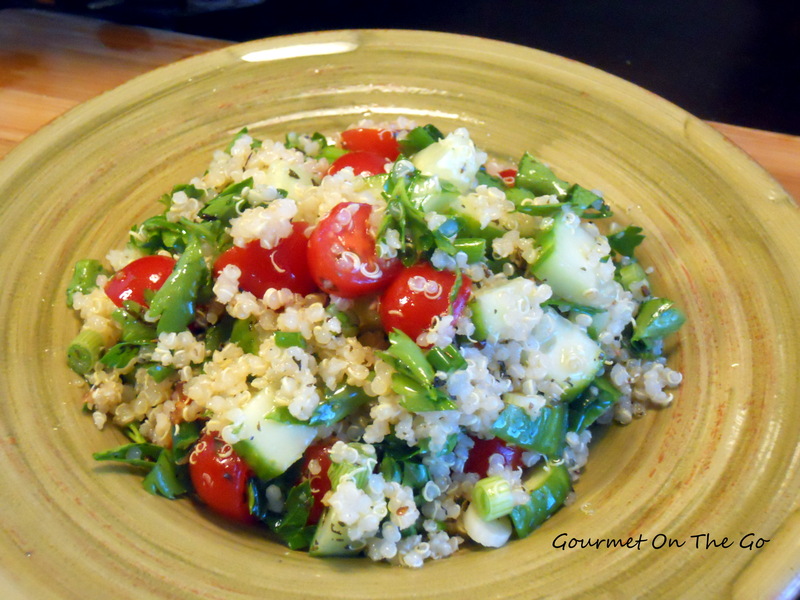 Then there’s tabbouleh! Tabbouleh is an arabic salad traditionally made of bulgur although sometimes bulgur has been substituted with couscous. If you’re looking for something new to try that’s absolutely healthy give this recipe a try as a main vegetarian course or a healthy side dish! Place the quinoa, ½ tsp kosher salt, and 2 cups of water to boil over medium high heat in a medium saucepan. Lower the heat, cover the saucepan and simmer for 10 minutes. Remove from heat and let stand, covered, for 5 minutes and fluff with a fork. After fluffing, spread the cooked quinoa on a large baking sheet to cool throughly. When cooled, placed quinoa in a large mixing bowl. While the quinoa is cooling, mix the lemon juice and minced garlic in a bowl. Slowly whisk in the olive oil and season the dressing with salt and pepper to taste. Add ¼ C. of the lemon dressing. Add the vegetables, herbs, and scallions to the quinoa. Toss. Season with kosher salt and pepper to taste. Drizzle with the remaining dressing.